The Swedish magazine "Teknikens Värld" has published in their current issue the Summer Tire Test 2015. The tested tire size was 225/45 R17 W/Y, test vehicle was a Volvo V40 T5 . The test was conducted by Teknikens Värld on public roads and partly on the proving ground of Continental Gislaved / Sweden. "In all safety related test disciplines no one comes even close to Conti"
The Polish magazine "Motor" has published in their issue (14-15/2015) their Summer Tire Test 2015. The tested tire size was 225/50 R17 W/Y, test vehicle a BMW 328i. The test was conducted by Motor on Continental´s proving ground in Uvalde/Texas. The Russian magazine "Autoreview" has published in their issue the Summer Tire Test 2015. The tested tire size was 225/45 R17, test vehicle was a Audi A3 Sedan. The German magazine "sport auto" publishes in issue (05/2014) an UHP Summer Tire Test. The tested tire size was 225/40 R18 Y and the test vehicle a VW Golf GTI. The test was conducted by sport auto on the Contidrom proving ground in Jeversen/Wietze. Rating for the ContiSportContactTM 5: "Recommended"
In their March issue, Auto Bild Allrad (D) has published the 4x4 Summer Tire Test. The tire size was 255/55 R18 V/W/Y, test vehicle BMW X5. The test was conducted by Auto Bild Allrad in cooperation with Continental in Uvalde/Texas. Rating for the ContiSportContactTM 5 SUV: "Testwinner"
The German magazine "Auto Zeitung Allrad" publishes in issue (02/2014) a SUV Summer Tire Test. The test size was 255/50 R19 W/Y and the test vehicle a Mercedes ML 350. The test was conducted by Auto Zeitung Allrad on the Continental proving ground in Uvalde/Texas. The ACE (Auto Club Europa) and German GTÜ (Gesellschaft für Technische Überwachung mbH) have published their Summer Tire Test 2014. The tire size is 225/45 R17 tested on VW Golf and Seat Leon. Rating for the ContiSportContactTM 5: "Very recommendable (Testwinner)"
The german magazine "Auto Zeitung" has published in today's issue (No. 6, 2014), a Summer Tire Test for the tire size 225/50 R17 W/Y. Test vehicle was a BMW 320i 170PS. 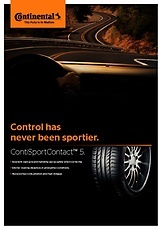 Rating for the ContiSportContactTM 5: "Testwinner"
" It doesn't matter if the track is wet or dry: The Test Winner Continental ContiSportContactTM 5 rolls not only fast, but also always very securely "
have published the Summer Tire Test 2013 on their homepages. In their September issue, Auto Express (UK) has published the Annual Summer Tire Test 2013. The test size was 225/45 R17, test vehicle VW Golf VII. "Great all-rounder takes win, and sets a new standard for braking." "Very good braking and aquaplaning combined with only small compromises elsewhere to seal the win." "The engineers at Continental have really found something when it comes to stopping, both in the wet and the dry." OEAMTC (A) and TCS (CH) which have been communicated earlier. 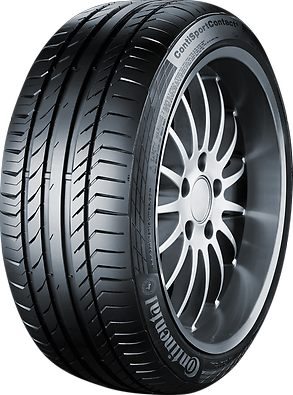 Rating for the ContiSportContactTM 5: "Good"
+ "Our recommendation: The best tires are ContiSportContactTM and Goodyear Eagle F1 Asymmetric 2"
In their March issue, Auto Bild sportscars (D) has published the UHP Summer Tire Test 2013. The test size was 225/35 ZR18, test vehicle Mini Cooper S JW. Rating for our ContiSportContactTM 5: "Highly recommended"
The ContiSportContact™ 5 was awarded an AutoExpress Best Buy (2013) and is highly commended by AutoBild (2014).